Ready to spend 28 days or more in paradise? If so, Gulf & Bay Club 102B is waiting for you. 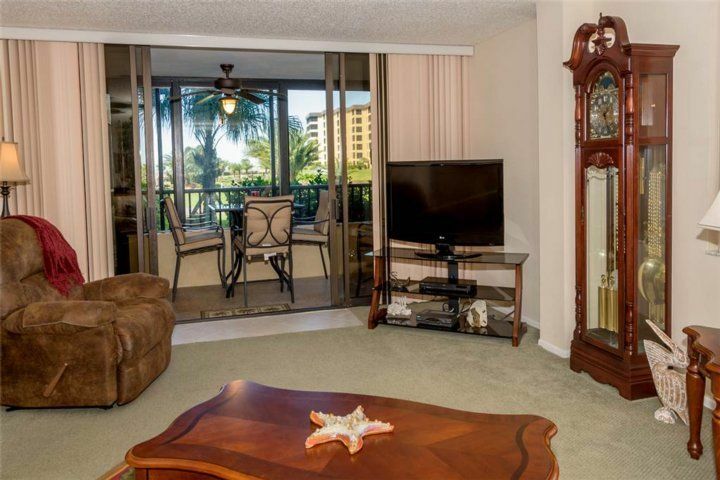 This ground-floor condo is located in a 32-acre resort community just steps from the sparkling white-quartz beach deemed the country’s best by the TripAdvisor’s Travelers’ Choice awards. 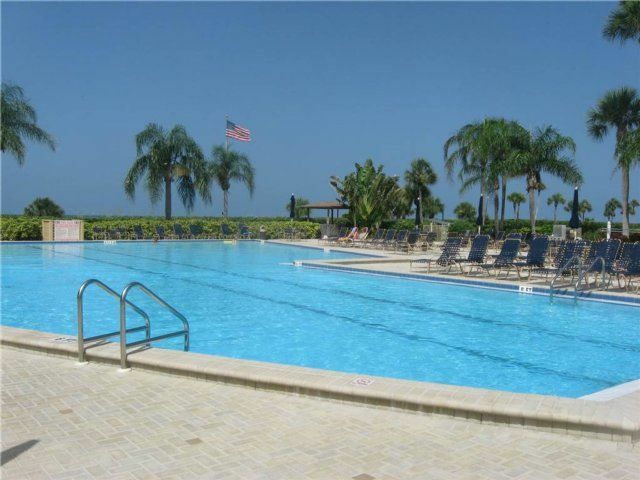 One of the most luxurious condo communities on Siesta Key, Gulf & Bay Club boasts 3 heated pools (just in case that minute-long stroll to the beach and the Gulf of Mexico is too taxing!). After your swim you can laze on a poolside chaise, listening to the palm trees rustle in the salt-tinged breeze, or enjoy a snack at one of the patio tables beneath the shade of a sun umbrella. The resort also has a freshwater lagoon with a footbridge toward an island in its midst. 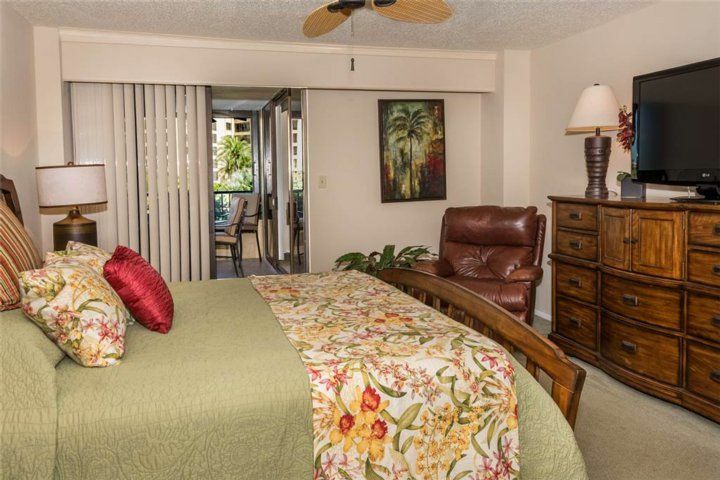 When you’re not walking along Gulf & Bay Club’s lushly landscaped grounds, you can get some exercise on its 8 tennis courts, basketball court, or racquetball court. The complex has a well-equipped fitness center too, where you can lift weights or work on a machine while gazing out at the gardens. Afterward, pamper your weary muscles in the dry sauna or the hot tub. And if a spot of rain has you inside, you can shoot pool in the game room or take advantage of the complex’s print and video libraries. 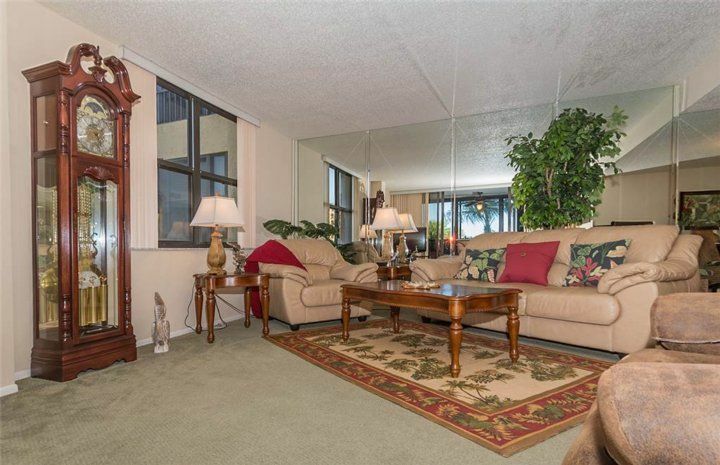 As for unit 102B, it’s as relaxing and delightful as the rest of Gulf & Bay Club. 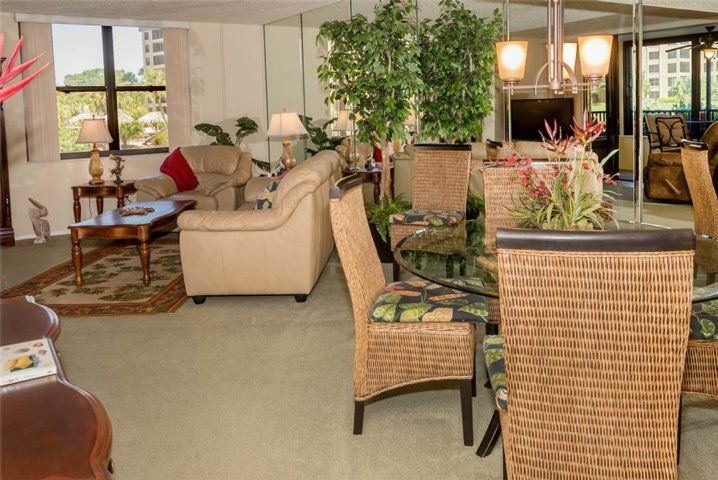 The enclosed lanai is sure to be a favorite spot to enjoy your morning coffee. 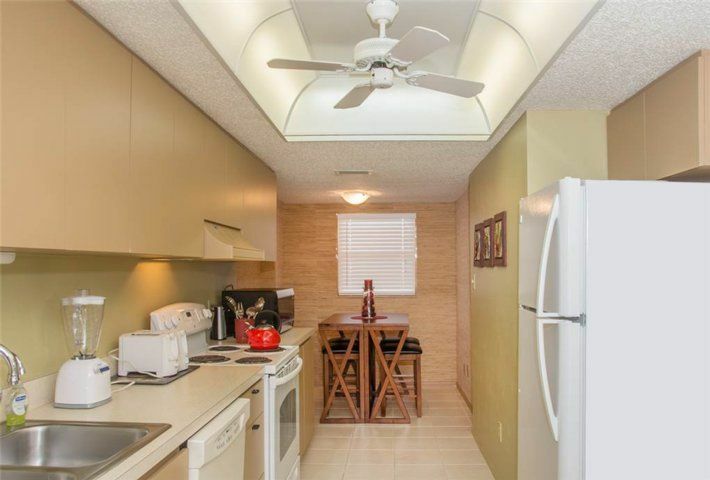 Thanks to its ceiling fan, it’s also a cool space for some midday quiet time. 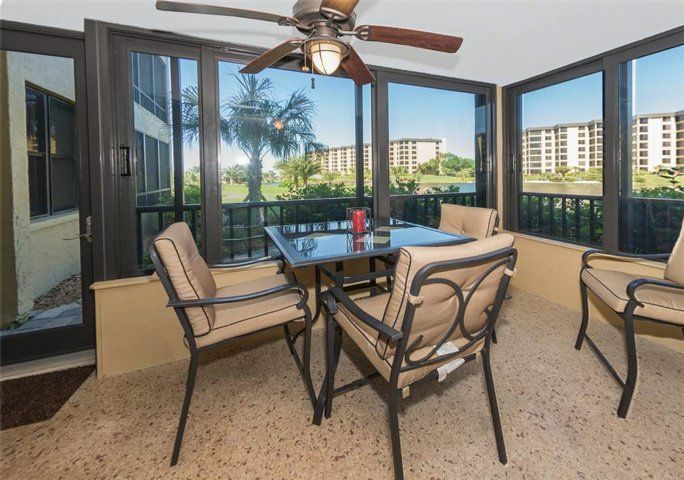 Sliding glass doors connect the lanai to living/dining area. 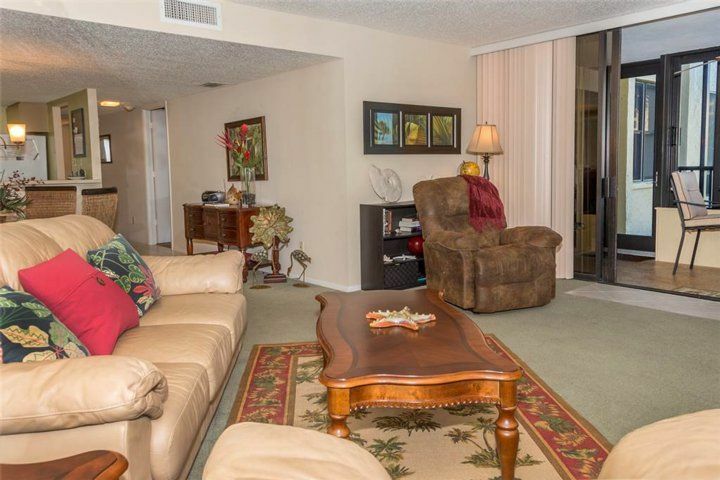 Once you sink into the living area’s plush leather seating, you might never want to get back up! 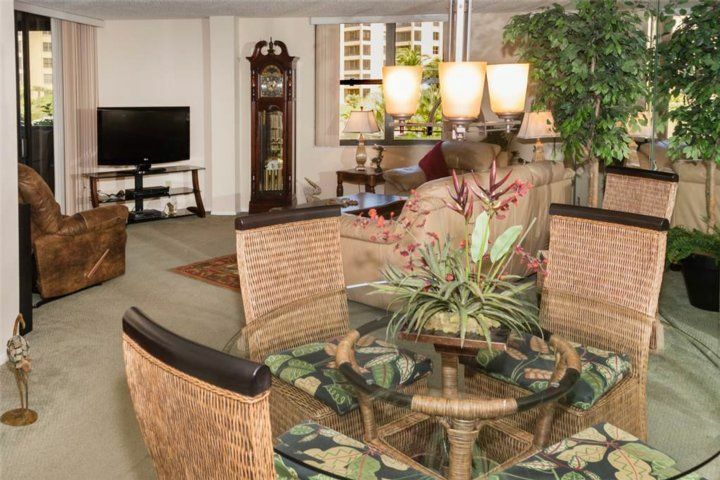 Happily there’s free WiFi to keep you entertained while you relax, plus an HDTV with cable and a DVD player. 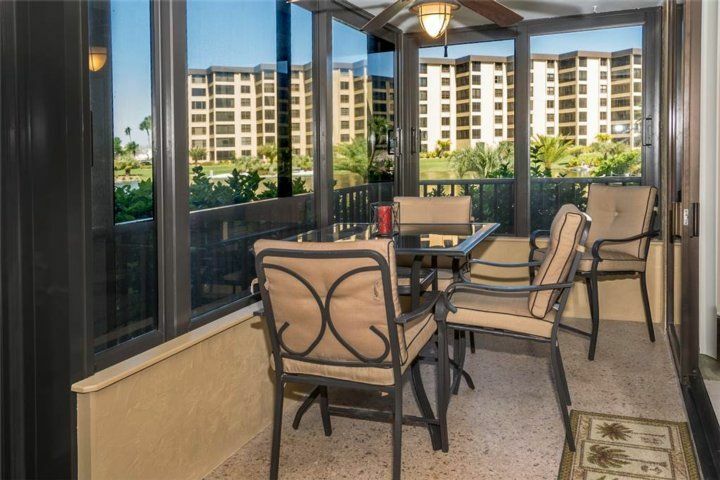 Because the lanai has a patio table and chairs, you can dine out there. 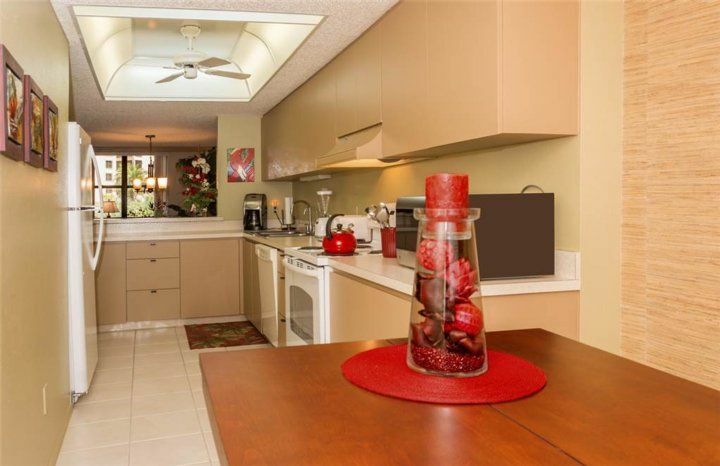 If you want a true alfresco experience, you can cook on a grill and dine at the complex’s tiki-themed picnic area. 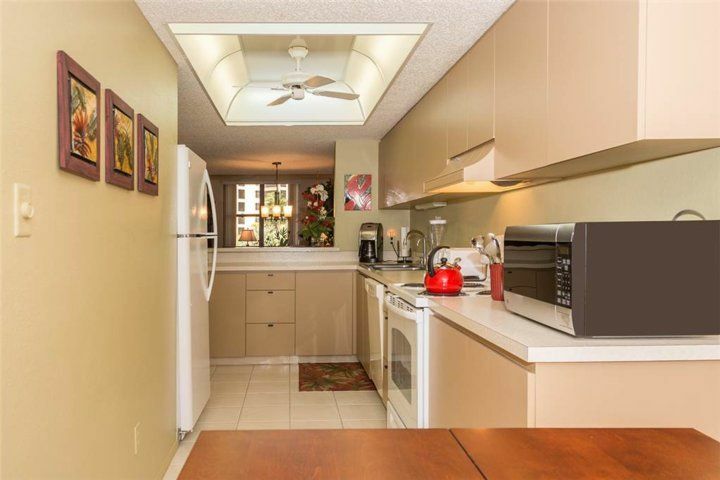 Or you can gather at unit 102B’s indoor dining table, which seats 5, or in the breakfast nook tucked behind the kitchen. The nook can also serve as an office during your stay. 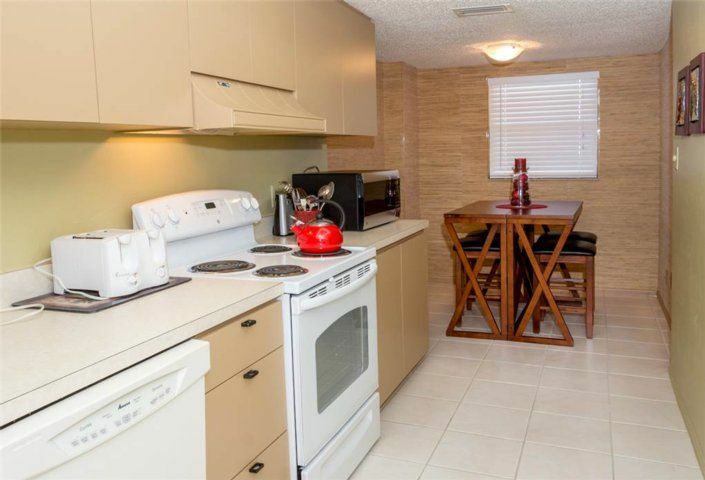 For its part, the kitchen is fully equipped with appliances, cookware, and tableware, along with plenty of counter space and storage. 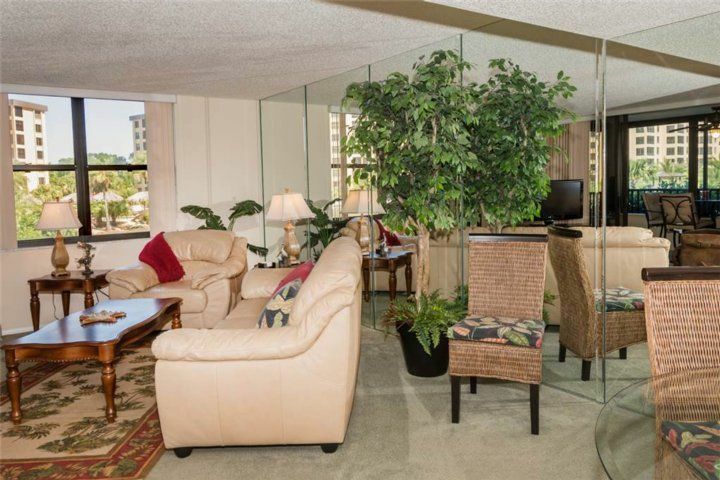 Gulf & Bay Club 102B has 2 bedrooms and 2 bathrooms. 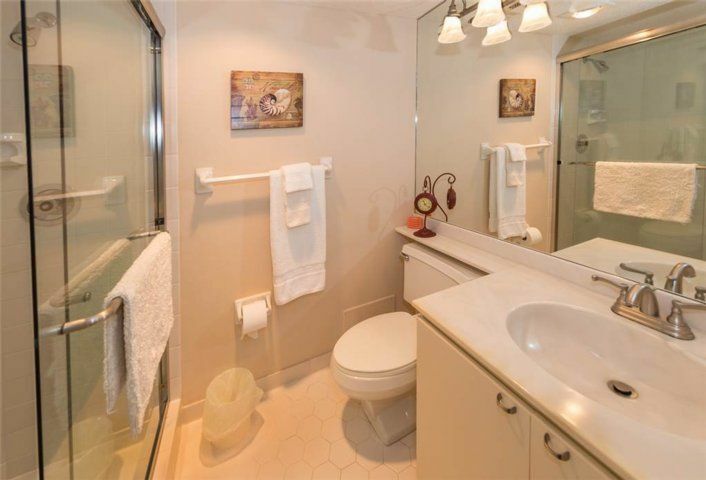 Having a bathroom for each bedroom makes life so much easier—you can indulge in a leisurely bath or shower without a line forming on the other side of the door. 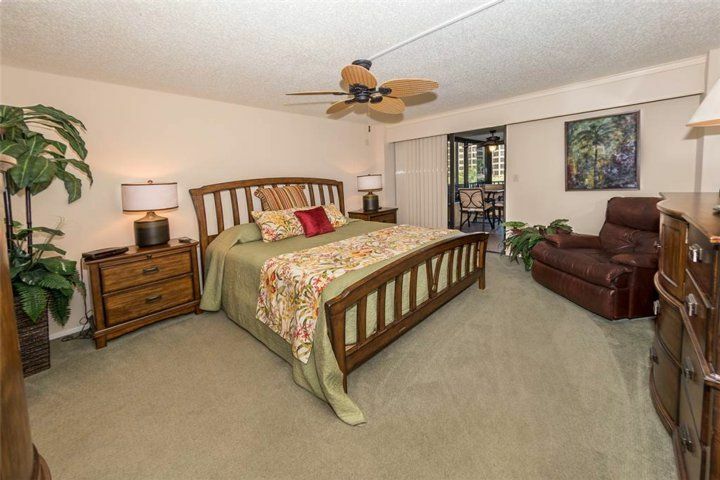 The master bedroom’s sumptuous king-size bed all but guarantees a great night’s sleep. 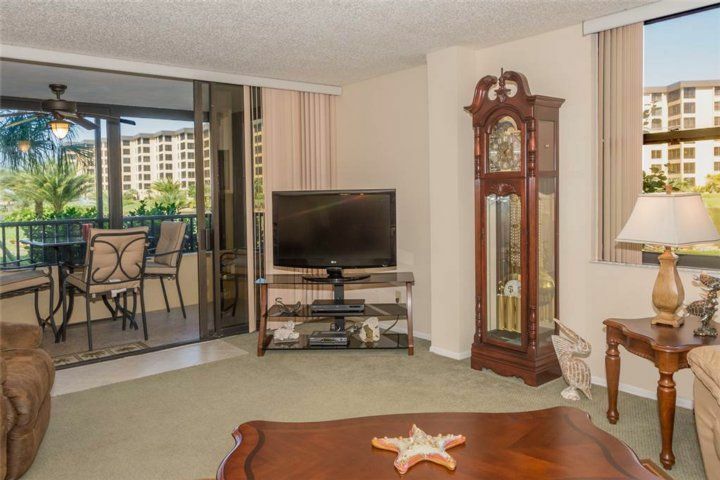 The room also has a flat-screen TV and sliding doors that open onto the lanai. The 2nd bedroom has a pair of twin beds. 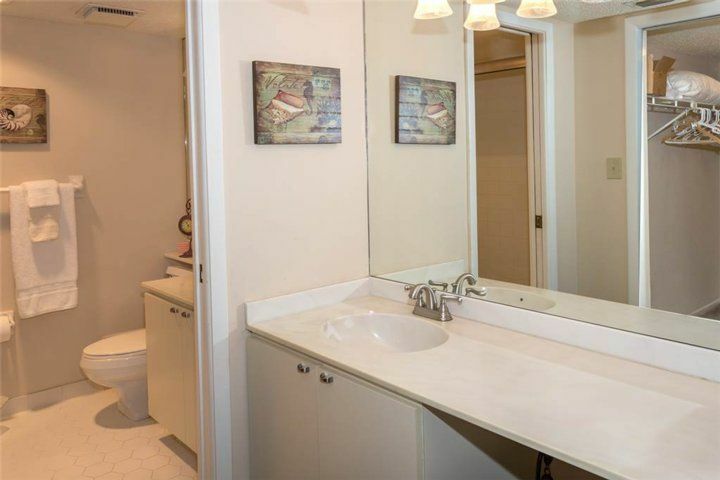 Both rooms feature loads of storage. Even though 102B has a 28-day minimum stay, however, you can still pack light: The unit has its own private washer and dryer. And if you have additional guests coming to visit, the living room sofa converts to a bed for 2. You might find yourself spending much of your stay within the Gulf & Bay Club complex—there’s so much fun to be had on its grounds. But the beach and the gulf are just yards away. Once there you can parasail, paddleboard, canoe, kayak, jet ski, search for shells, or simply watch dolphins frolic in the surf. For a change of pace. drive over the bridge that connects Siesta Key to the mainland and explore Sarasota. The Ringling art and circus museums are must-visits, as is Ca’ d’Zan, the extravagant one-time winter home of John and Mabel Ringling. Or drive up to Mote Aquarium (it’s only 25 minutes away) and view its manatees, sharks, sea turtles, and other marine animals. When you stay at Gulf & Bay Club 102B, you can do it all—or do nothing at all except revel in the Florida sunshine. Don’t miss out: Book your stay today! 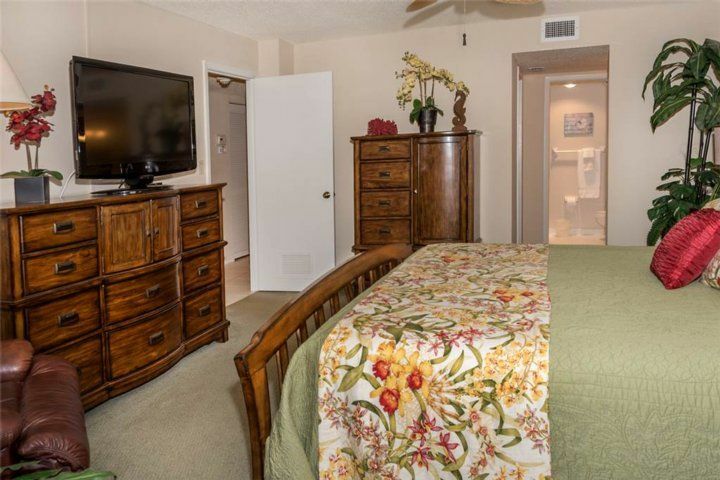 Vacation Rental Pros Show Phone No.